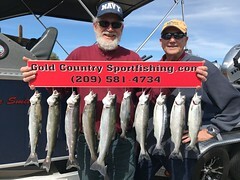 New client Bob and his son Spencer were onboard on Saturday October the 14th to see how and hopefully catch some king salmon. instructions were first on what happens we get a fish on ,and on the first pass that happened. 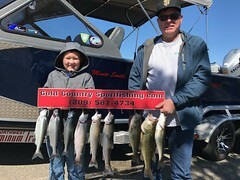 It was Spencer’s idea to take his dad fishing, so it was Bobs turn first, and when he was fighting the first fish of the day as it neared the boat and few swift maneuvers around the boat, the fish came undone Ugh! but that happens in this sport, however this would not be the only chance of the day. 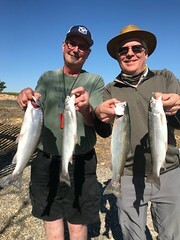 Spencer did not get a turn but his dad Bob did and landed his limit of Sacramento River king salmon. Turns out Bob went to the same high school I did, he was a few years ahead of me and it was great catching up on the past. A great day with great people. Thanks again guys!! !